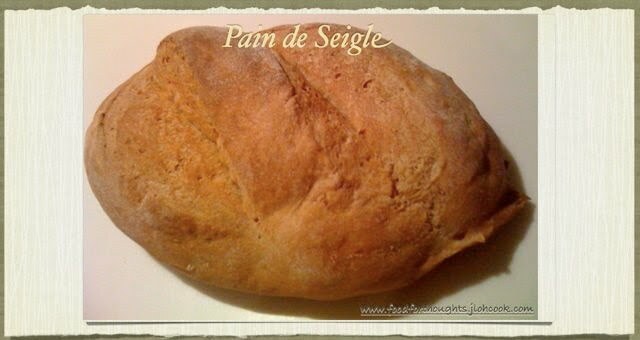 I researched a little on how a Pain de Seigle is like, it seems to be made of darker rye, and a minimum 40% of the whole loaf is rye. 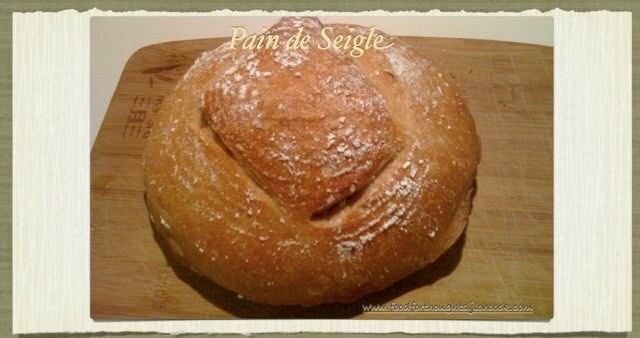 I only got Light Rye but I do have enough to make slightly over 40% of rye, so, I guess I can claim mine is a Pain de Seigle. 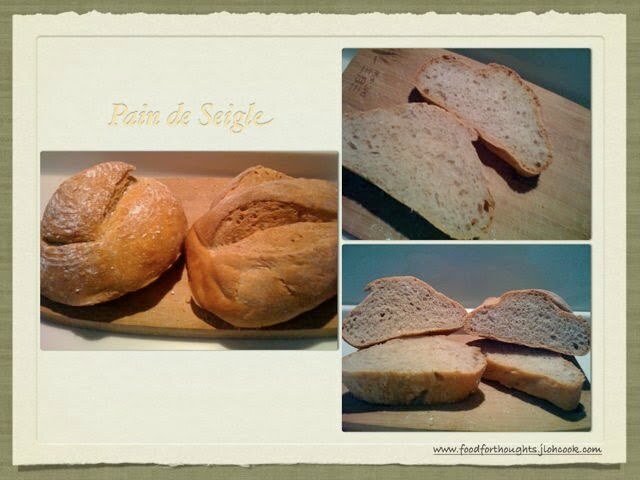 Ialso further research on what it looks like, in the book it's twisted but I really didn't like the idea of twisting it into a big loaf, I saw many made it into boule, I decided to make boule and oval (more like a bloomer look). Mix all and put aside for 24 hours. It'll turn darker in colour and bubbly. Put in the water first and mix in the flour. Stir well. It will become a creamy paste. Set aside for 24 hours. It'll turn bubbly again. Same as the 1st refreshment. Stir well. This time, the paste is thicker. Set aside for 8 hours. I calculated my timing wrongly, and it was Friday morning, I had to work. Sought help from my community - The Fresh Loaf, and was advised that I can put into the fridge before I start adding the dough. That's what I did. I put it into the fridge. Add the ingredients into the Chef and mix well. The gluten started to form very very well. Usually I don't get such results from the use of rye, and this is a nice surprise. I started kneading ad kneaded well. It still felt a little sticky after much kneading and when I felt it was ready - smooth and silky. Set aside for 1 hour to rise to double. It rose very very nicely. Again, this was a nice surprise. I cut it into 2 pieces, end up with about 350g each. I shaped one into an oblong shape, I just bought a oval baking dish, so I lined with cloth and put corn flour over it, and lay the dough in. The 2nd one I did it into a boule, and decided to use my plastic basket to get the lines. after 1 1/2 hours, both had doubled beautifully. For the bloomer shape, I decided to bake first. I score it and put into the pre-heated oven with the preheated claypot. I used my big claypot to cover it and uncover after 20 minutes of baking. 20 minutes of baking nearer to the top. The bread rose a little, more and was not as golden brown as I like it to be. For the boule, I left it in a smaller claypot with cover in the fridge. It was very very late on Friday night, I needed my sleep. In the morning I took it out of from the fridge, the dough was a little spread out and flattened a little. This went straight into the oven without preheating. I left it covered for 35 minutes and uncover it for another 20 minutes of baking. 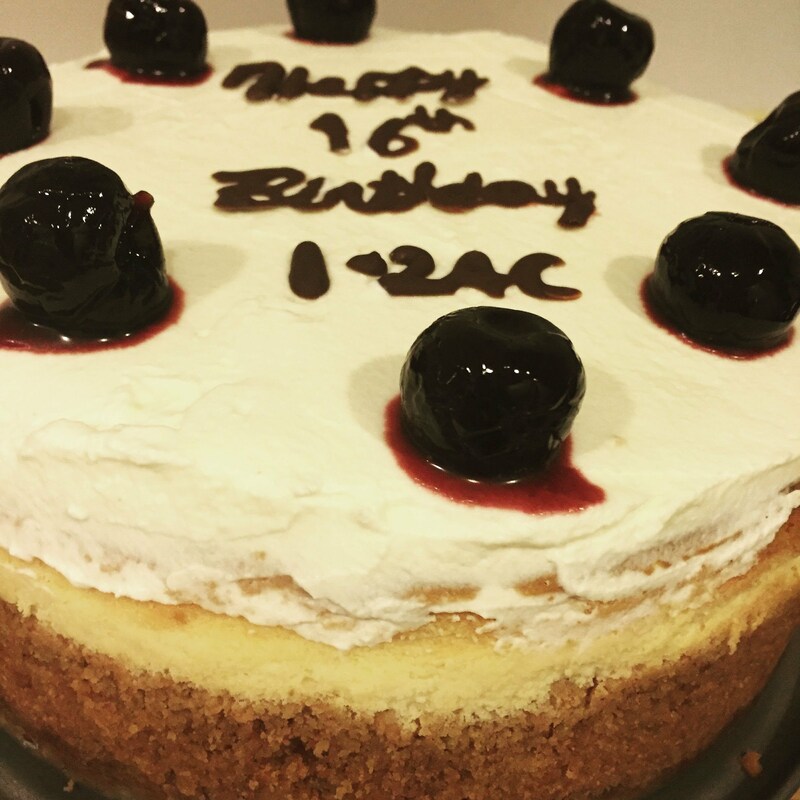 This turned out more golden brown. The crust is not as crispy, but the inside is really soft and chewy.